Thomas Bird Mosher's career as a publisher took off in 1882 when he became a partner in McClellan, Mosher & Co., a firm that ended in bankruptcy in 1889. Mosher established his own firm, Thomas B. Mosher Company, the same year, selling stationary and law books, but soon turning to literature. By that time - he was nearing forty - Mosher had also acquired a small personal library, of which he made a catalogue: there were over 350 books. In 1891 and 1892 he published his first literary works, written by George Meredith and James Thomson. His third publication was the first of 'The Bibelot Series'. 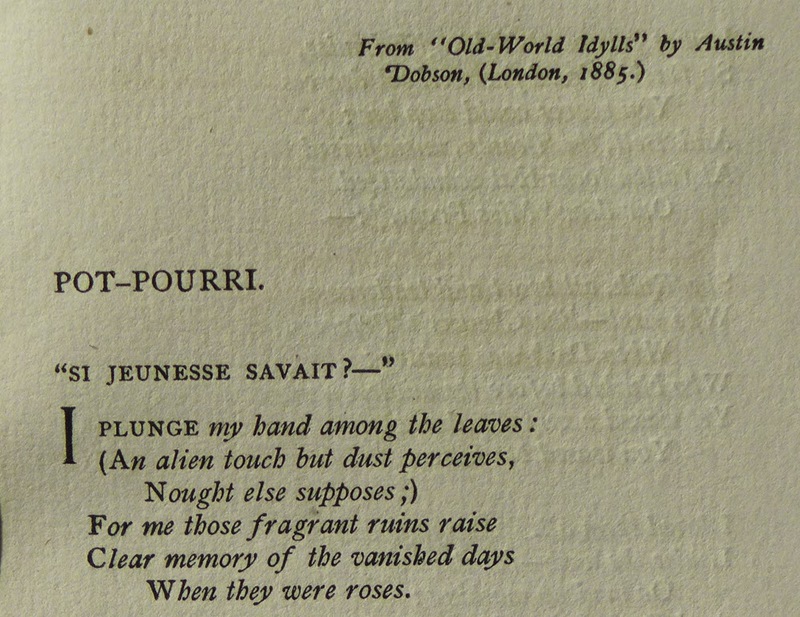 This poetry anthology, Songs of Adieu, appeared in November 1893. The book's format and the type size are reminiscent of another book of poetry that had appeared in London, John Gray's Silverpoints, issued in March 1893. 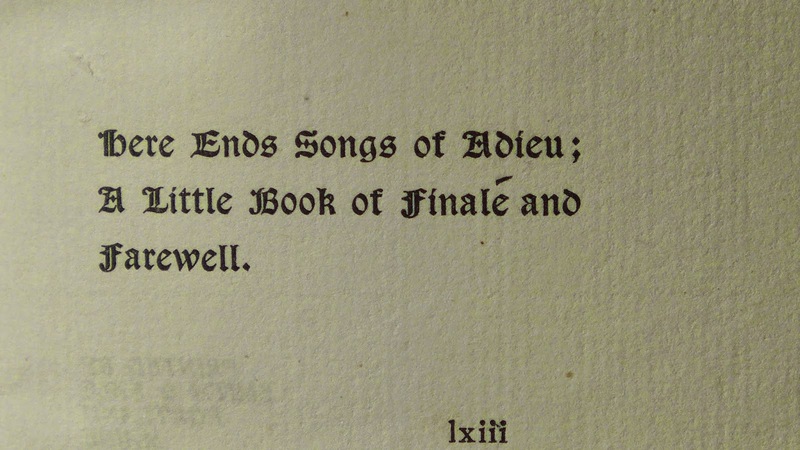 It seems that Mosher owned a copy before the end of the year, as the layout of Songs of Adieu is almost certainly inspired by it. 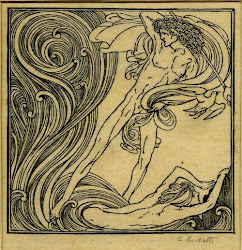 In 1906 he would copy its cover design for a catalogue. Both use an italic type, and pages are numbered using Roman numerals. Both employ left-justified titles (set in even capitals) to the poems. Both use a large capital letter to begin each poem, the top of which extends above the other letters of the line. Both begin the first word of all the other lines of verse with an upright Roman capital letter followed by all italic letters. For Silverpoints, another type and size were chosen. Ricketts - by the way, this is the first time that the type has been looked at seriously - used a 9-point Caslon typeface, the Caslon Old Style Italic, which he combined with Lining Old Style for the roman characters. It has been noted that two different types of 'h' appear in Silverpoints (**). Caslon types came with some extras, which were called 'Peculiar Italic Sorts' that were supplied with founts from 36-point to 8-point. 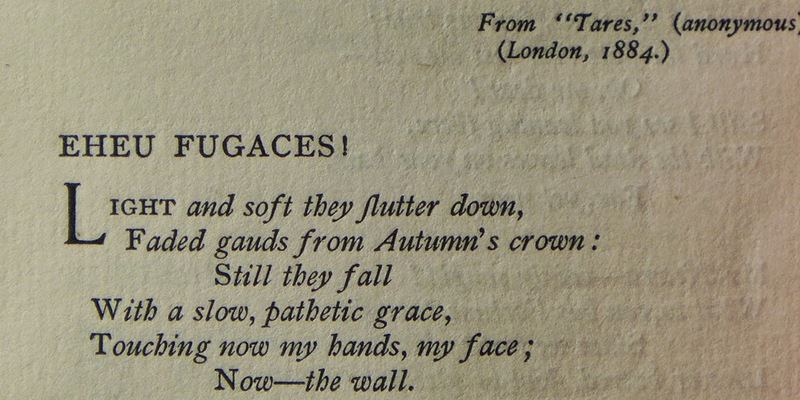 Ricketts made use of those peculiar types, sometimes showing the two different characters 'h' (one almost resembling a 'b') in one sentence, as in a translation from the French of Baudelaire. See the words 'thy head' in line 7. Ricketts also made abundant use of swash letters, which were part of the 'peculiar sorts'. 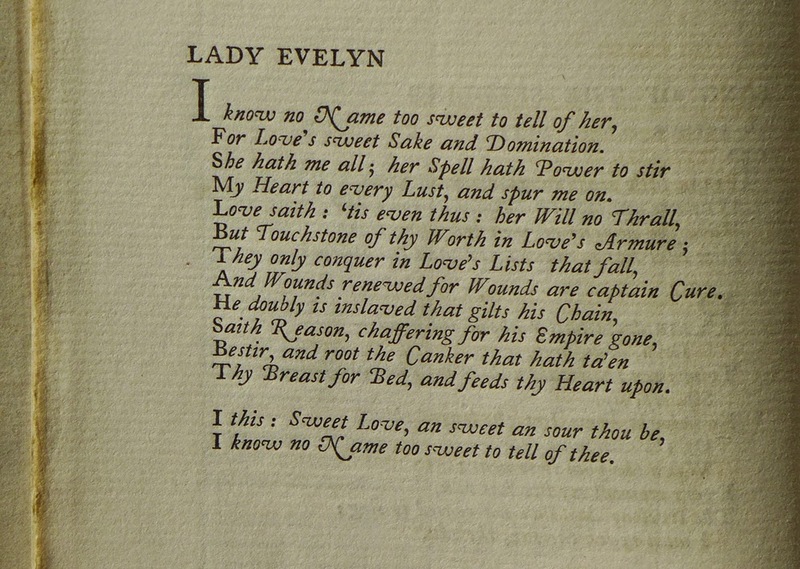 In Gray's poem 'Lady Evelyn' (page viii) several of those can be seen; the 'N', 'R', and 'C' are the most eccentric. Mosher did not imitate these peculiarities. Charles Ricketts, in 1893, considered the book to be a unity, and used only one type fount. Mosher did not. The last text page, for instance, introduces a black letter (or gothic type), of which there were many in the early nineties of the nineteenth century. But then, Mosher was not as consistent in his layout as Ricketts strove to be, and did not treat the book with Ricketts's firm convictions. For example, the page numbers were in roman numerals (such as 'lxiii'), however, the 'Contents' page (a page that Ricketts discarded whenever possible) refers to the pages in arabic numerals ('62'). Ricketts's title page for Silverpoints is as austere as it gets, with only two small blocks of text, containing title, author's name and imprint, all in small Caslon capitals. Mosher tried to embellish the title page, for which he used colour, but not the Elzevir types. The page was not typeset, but fully hand-drawn, and photographically reproduced. In the title, for instance, we can clearly see two different characters 't' in the word 'little', and the same goes for the others. This is far removed from the principles of the revival of printing that were to be laid down in tracts before the end of the century. But even after the publication of William Morris's 'The Ideal Book', Mosher would not convert to the use of only one fount for a book. The nineteenth-century practice of displaying several types on a title page or on a cover would live on in his publications. (*) See William E. Loy, Nineteenth-Century American Designers & Engravers of Type (2009), p. 56. (**) See Peter J. Vernon, The Letters of John Gray (1976), p. 120.